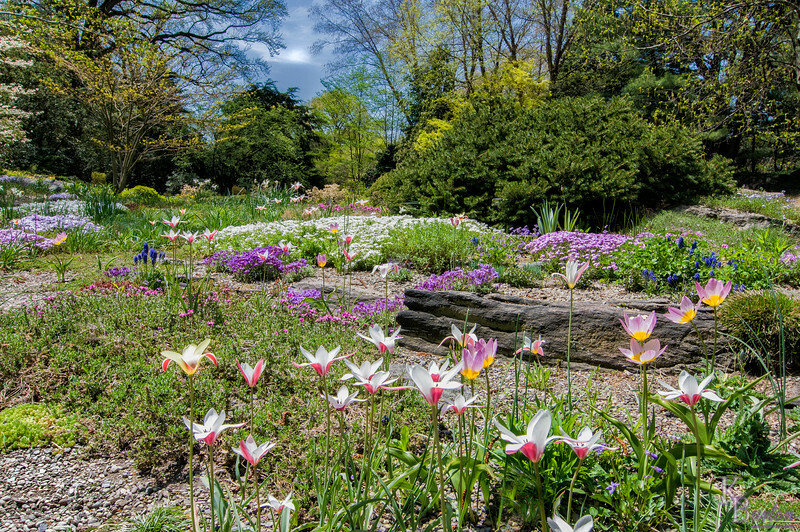 It was a beautiful spring day in May of 2015, and I had planned that if the weather turned out to be this nice I was going to load up for bear and trek up to the Bronx and spend the day at the Botanical gardens. Any time I plan on taking loads of camera gear in tow, I choose to do it on a weekend if at all possible, when mass transit would not be so packed with riders, making my heavy laden commute much much easier. Also on weekends the Botanical Gardens often holds many different events to entertain, enlighten and please the visitors that show up. Today it was free wine tasting. But as I don't drink (I just took pictures of the coolest looking wine bottle holder instead), I took pictures of the beautiful spring flowers instead. Of the many marvelous photogenic locations I visited my favorite was here in the rock gardens. These pictures do not do the gardens justice. It really is that lovely.